In 2018, current CEO James Napier, being a knee down amputee, was determined not to let that disability affect him. James reached out to a friend, fellow patriot, serial entrepreneur, and current COO Lance Wood. Together, while eating some special hot sauces at a local barbecue, James thought that he could sell these hot sauces. In collaboration with their wives, The Patriot Brands LLC was launched shortly afterward. James then resurrected his dream of selling jerky. Being a local mom and pop shop with great capacity as a full service meat processor, James had secretly been working on perfecting some jerky flavors. Teaming up with trusted FDA certified processor Kill to Grill with their decades of experience manufacturing jerky, this The Patriot Brands Jerky was officially launched. Late in 2018, The Patriot Brands LLC introduced meat sticks to their line of products for sale. This jerky is distributed by The Patriot Brands LLC, and they are located in Cuba, Missouri. The next review on The Patriot Brands Jerky will focus on a 3 ounce/84 gram bag of their Mount Vernon Cherry Blossom flavored beef jerky. This flavor is described as a NEVER achieved flavor until now – Sweet flavor of Cherry but not to be confused with candy~ THIS is steak in the bag!’!! The bag was graciously submitted for review by COO Lance Wood. Ingredients: Beef, BBQ Jerky Seasoning, (Sugar, Salt, Dextrose, Spices, Tomato Powder, Onion and Garlic Powder, Corn Starch, Natural Smoke Flavor (Contains Citric Acid, Spice Extractives, Cherry Juice (Water, High Fructose Corn Syrup, Potassium Sorbate, Sodium Benzoate, Red 40, Sulfur Dioxide), Vinegar, Sodium Nitrite. The only liquid marinade used here is a not so good brand of cherry juice, and healthy vinegar. This cherry juice uses the cheap highly processed sweetener high fructose corn syrup (HFCS) to lose a rating. This cherry juice uses the unhealthy artificial color red #40 to lose another rating. Some healthy ingredients are added such as garlic powder, spices, tomato powder, and onion powder. For a sweet based flavor as we have here, the sugar level is acceptable at 4 grams of sugar per 28 grams of jerky. The salt level is on the high side at 600mg of salt per 28 grams of jerky to lose a rating. Our preference is 350mg of salt or less per 28 grams of jerky. This jerky does not qualify to have no sodium nitrite added, as sodium nitrite is used outright to lose a rating. To a lesser degree, citric acid also acts as a preservative. Admirably, this jerky does qualify to have no added MSG. 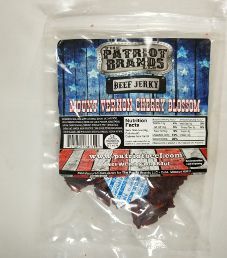 The Patriot Brands Jerky Mount Vernon Cherry Blossom Beef Jerky has somewhat of a sweet and savory taste. This is enhanced by light garlic, onion and a subtle smokiness. The cherry flavor is more of a fruity taste at first and as the brain begins adjusting, this unique and delicious cherry and fruity flavor becomes more apparent. As I chewed more little pieces the taste kept intensifying while always remaining at a reasonable level without being too pronounced with this unique and familiar flavor we all appreciate. Although each of us was a little skeptical at first, this flavor does taste much better that what most would expect. This flavor is reminiscent of a Barbecue flavor and while the cherry taste leaves some to the imagination, this jerky is undeniably tasty. The natural flavor of meat is still palpable although a bit muffled by some of the other ingredients. The flavor profile is nicely balanced with a little splash of vinegar. These strips are medium in size and thickly sliced. The texture is on the soft and tender side and requires minimal chewing action. 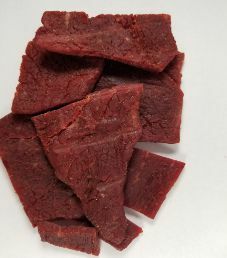 The Patriot Brands Jerky Mount Vernon Cherry Blossom Beef Jerky taste generally good and perhaps a little more richness or smokiness would create more depth in flavor. This in turn would yield more of a “WOW” factor with bolder flavor and more character. This jerky would be best appreciated by fans of cherry smoked and soft or tender jerky. We’ve awarded a Very Good (9/10) taste rating. Cheers! A 3 ounce/85 gram bag is currently sells online for $6.75. That works out to $2.17 an ounce, which rates as a cheap price. Free shipping on online orders of $30 and a free pocket Constitution! The majority of bag categories are covered here. Missing is a blurb printed about The Patriot Brands Jerky and this Mount Vernon Cherry Blossom flavor, Also missing is a best before date, but a sticker on the back is likely the batch number, which could translate to a best before date.